You can see the before and after, and the process here on Paula's site. On Twitter, I saw a tweet by a designer and followed it to her blog. And I found this picture of one of my most favorite rooms ever. She was discussing how the same picture was being used in a book without giving her any credit. Now that just isn't right. 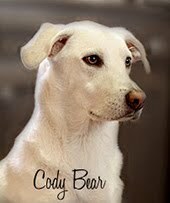 Of course when I used her as my jumping off point several years ago for a dining room makeover, I did show her room picture on the decorating site I belonged to, but I did not mention her by name. Sorry. This is the beautiful work of Paula Prass. 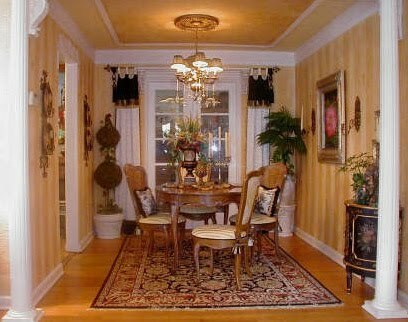 Be sure to go by and see how Paula transformed this lack luster room into a charming cottage dining room! I feel so in love with this room, it is the one only time I really did just flat out borrow so many ideas from another decorator. 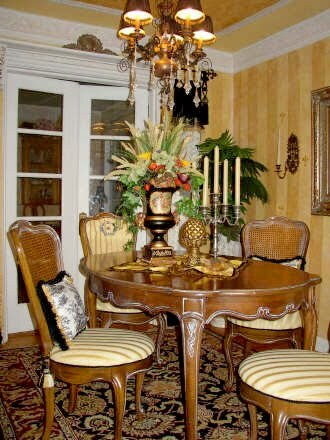 When I saw her dining room, it was so familiar to me and my tastes that I wanted to move right into it. So I did the next best thing and recreated lots of her ideas. What I thought would be the easiest part was finding a pretty stripe fabric, but that proved to be more difficult than I thought it would be. The colors were all wrong or the weight of the fabric wasn't right. I finally found the perfect one, and from there I was off and running. 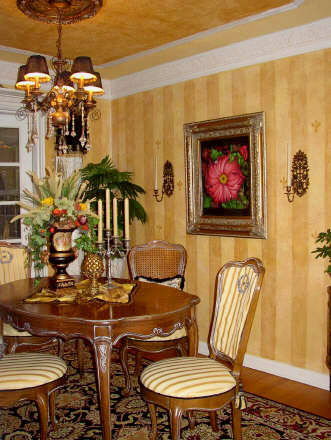 The walls were painted in a two tone yellow/gold stripe with a metallic glaze over the top of the darker stripe. It was warm and really inviting in a room with no windows. The ceiling was changed by adding molding to make a mock step-up effect, and then was painted the same colors that were on the walls. The chairs were reupholstered in the stripe fabric and then I made a bee design on the back of the end chairs. Yes, that idea came from Paula as well. I had to deal with the problem of having no windows since Paula had such a wonderful idea for her window, and the white was a very needed design element for a break from all the color in the room. This room did however have French doors leading to the morning room. So I made simple panels of white on white damask with a black top valance. The dining room stayed like this for a little while and I totally loved it. Since redoing it, the panels and pillows have found their way to Sweet Daughter's house which is the most fun way to rationalize changing my decorating. I saved everything when I made changes just in case she might wish to use anything when she was making her nest. Today the dining room has very deep gold walls, but not the same, and everything else has changed except I kept the furniture and the original watercolor painting by Sweet Husband. Then I found the fabric that the chairs are upholstered in today, and a new love affair began. Yes, the fickled heart of a decorator falling for a fresh new line. That lime green and brown is still here, and I don't think it is changing any time soon. Although I'm toying with moving the dining room to the little used living room area, and making the dining room just a little sitting area. Please don't freak. I seriously was on Twitter and saw someone's Follow Friday post, saw one was The Decorated House and of course wanted to go check it out. Totally random and Twilight Zonish. I like to see how people will adapt an inspiration picture to their own home. Chances are you will never have the exact size room, windows or flooring as an inspiration picture, so you have to make it work for you if you want the look. I think you did a great job of this! I'm going to check out Paula's site now. Excellent job! The room does look incredible! I love how you save everything just in case your daughter might want to use it in her home. She's a lucky girl! I've always loved your dining room, either way, Donna! Gorgeous! I remember your DR. It was gorgeous! Can we see how it looks today? OMGosh! 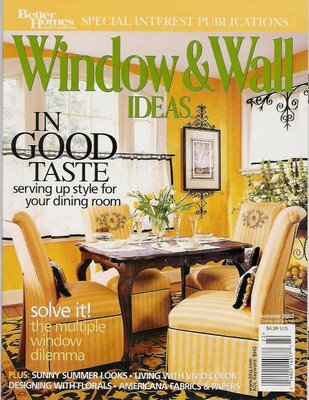 I have saved that magazine over the last few years simply because I loved the photo on the cover of that dining room! And now I see yours! Great job. Thanks so much for sharing this. Very inspirational! Your home is beautiful! I love the chandelier and the painted chest chest. Your walk way is stunning! I can certainly see why you loved Paula's room! A special thanks to Paula for stopping by! Great story, and very Twilight Zone Good. I will look and see if I can find a close up picture of the bee design on the chair, or find the fabric that I think I kept. I think I used my printer and printed the design on iron-on fabric, and then cut around the design. It's time to get some better pictures of the dining room. The old pictures were with my older camera, so I'll post that soon, too. How wonderful everything looks. With all of the blog reading I do, I haven't been giving my home magazines justice. That is a lovely room! I can see why it inspired you! How awful that they are using her picture without giving her credit! I gotta say though, love your dining room now more! What a gorgeous room you created! I love how you used the french doors in the design element. Your room turned out beautifully! Fabulous job!